We have been long-time friends of Hector Montoya and admirers of his tenacity and entrepreneurial enthusiasm. Hector's efforts of late via his firm 3Tek SOLAR, Inc. have been to introduce solar power to the maquiladora industry and his first project has been a big one. Hector partnered with Plantronics in Tijuana starting almost two years ago and the result is nothing less than phenomenal. His firm 3Tek SOLAR has designed and installed Mexico's largest rooftop solar project to date on Plantronics manufacturing facilities in Tijuana. ProMexico has taken note of 3Tek Solar's efforts and Plantronics spirit of innovation and produced a detailed article in their publication Negocios and we would like to share it with readers of our MaquilaFind blog. The following is a transcript of the article. For a printable copy in PDF format, click here. 3Tek SOLAR, Inc. recently designed and installed the largest and most ambitious self-contained private sector rooftop solar project in all of Mexico. Such an achievement is the optimal platform from which to lead and revolutionize the country's adoption of green energy. 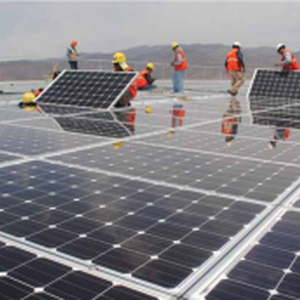 On September 27, 2014 the first gigawatt was produced by 3Tek SOLAR's sizeable photovoltaic installation on the Plantronics factory that produces telecommunications components in Tijuana, Baja California ñ serving as a 70% self-sufficient clean energy producer. For 3Tek SOLAR, the company responsible for the design and implementation of the project, the largest of its kind in the private sector in Latin America, this is more than good news. It is a testament to the effectiveness and value of what 3Tek SOLAR has promoted over the last five years among Mexican entrepreneurs: self-contained power generation from renewable sources. According to the company, this is the ideal moment to invest in renewable energy and see the immediate financial and environmental benefits of energy self-sufficiency. Hector Montoya, Director of 3Tek SOLAR, emphasizes that the considerable cost-savings exhibited by the monitoring system in the Plantronics photovoltaic installation should clear away any doubts or myths about alternative energy generation that remain in some sectors. The significant results in projects such as this one, clearly demonstrate that investments in solar energy produce immediate and tangible results and that companies who are committed to the idea will see marked savings in their operating costs. When Plantronics commissioned 3Tek SOLAR to develop their photovoltaic energy system, its long-term goal was to maintain constant savings of 70% of its current energy consumption, remarks Montoya. He recalls a phrase used often by executives in the solar industry in relation to cost reductions from renewable energy investing: Going Green makes you Green (dollars). In most cases, the internal rate of return is in excess of 14%. For financial analysts, that is a very good number, if not a great one, says Montoya. Systems that capture solar radiation and convert it into electricity allow companies to fix resource costs at current prices over the long term. According to 3Tek SOLAR, the average lifetime of photovoltaic modules is over 30 years, based on the manufacturers own standards. Moreover, since the systems have no moving parts, maintenance costs are minimal. Therefore, an investment in a solar energy system generally pays for itself eight to nine times over the course of its lifetime. At the Plantronics plant, the 1.16 megawatts photovoltaic system was installed with 4,300 solar modules occupying an area the size of two soccer fields. With such a large-capacity system, the Plantronics installation can generate close to 2 gigawatt hours of clean energy per year, which is equivalent to an annual reduction in emissions of 1,360 tons of carbon dioxide (CO2). Nationally, I know of no other company that has integrated a roof-top solar system on par with our Plantronics installation, says the director of 3Tek SOLAR. 3Tek SOLAR competed with US companies to win the bid for the huge development at Plantronics. Once it had secured the contract, the company leveraged its 20 years of experience in design and implementation of construction projects in the industrial and commercial sectors operating as Tri Tektura. Additionally, 3Tek SOLAR provided its expertise acquired over five years in power-needs analysis, and integration of alternative energy generation technologies. We developed a complete EPC turnkey package: engineering; materials and equipment procurement; permitting; and system construction, Montoya recalls. During the prospecting stage, it was necessary to think about the location of the solar power installation from the viewpoint of the local geographical and spatial elements. A basic premise of Hector Montoya is that industrial building design is all about maximizing long-term operations by reducing energy costs and managing natural resources. So, for the Plantronics project it was necessary to assess how optimal energy would be produced, at what times throughout the day, and how it would interconnect with the Utility grid. Further consideration was given to analyzing the best options for monitoring the system once it was in operation. For the execution of the work, approximately 100 people were hired for the better part of a year. According to Montoya, the staff was well trained to carry out a project of this magnitude with the expected quality standards, on time, and within budget. The technology providers were hired in the US, while the wiring and support systems contracts were allocated to local businesses. The advanced monitoring system was commissioned from a US company that provides the service over a five-year period. This enables the customer to obtain real-time power generation data at anytime during the day, how much is being produced, and what the average amount of generation will be for a given period. There is a new mindset and culture to be developed in Mexico, says Hector Montoya. From his point of view, Plantronics broke away from deep-seated beliefs in Mexico about the reliability of alternative energy systems. This highly successful giant step forward has served to trigger and expand new economic opportunities and establish an area of expertise in the solar industry in Mexico. 3Tek SOLAR markets itself as a company that bases its work on high standards of quality, safety and sustainability - a company able to provide and replicate effective practices. Given current economic conditions, in which interest in green energy and the benefits of the transitioning to them is quickly spreading, 3Tek SOLAR is collaborating with ProMexico to plan new paths for further expansion. Business leaders are going to realize that they should not miss out on taking advantage of the sun and the free, clean energy it provides. Furthermore, the openness to renewable energy is now clearly defined in local and national regulations. As part of that openness, a tax benefit has been established that will promote the growth of this sector as well as the company itself, said Montoya. Broader adoption of renewable energy systems make take some time, however it is a process that we are excited to be a part of and to take a leading role. Together with innovative industrial leaders such as Plantronics and skilled solar integrators like 3Tek SOLAR, we will most certainly consolidate its success throughout Mexico, he concludes.